Although Lombardy in Italy’s north has been called the ‘Ohio’ of Italian politics — it’s a huge prize, given that it’s the most populous and richest region, and one of the few regions currently too close to call — Sicily might well be the ‘Florida’ of Italian politics. It’s the fourth-most populous region of Italy, after Lombardy, Lazio and Campania, and with 27 seats in the Senato (Senate), it’s quite a prize. Like Lombardy, Sicily is essentially a toss-up in this weekend’s Italian general election. Voting is underway today and will continue throughout Monday. In addition to Sicily, the election remains close in three additional southern regions, in Campania (29 seats), Puglia (20 seats) and Calabria (10 seats) — polls, as of mid-February, showed the centrosinistra (center-left) coalition headed by Pier Luigi Bersani with a very narrow lead. Taken together, the four regions boast 86 seats, representing more than half the seats Bersani will need to form a senatorial majority — a far larger prize than even Lombardy’s 49 seats. 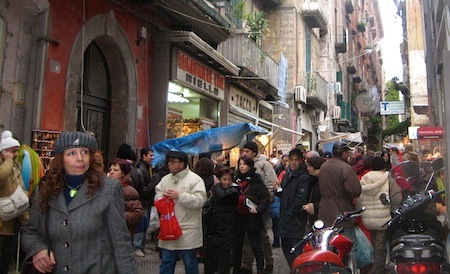 Taken together, the four regions are Italy’s poorest, nearly one-half as wealthy as Lombardy, and plagued by widespread unemployment, even before the latest European financial crisis — the four regions receive funds from the European Regional Development Fund to stimulate economic growth and modernize their economies. Since Italian unification in 1865, southern Italy never fully integrated into the rest of Italy, and governments for the past century have tried to develop plans to bring southern Italy’s economy up to a level more commensurate with northern and central Italy. In addition to their economic and cultural gap with the rest of Italy, the regions are hampered by their links to organized crime — the Mafia / Cosa Nostra in Sicily, the Camorra in Campania, the ‘Ndrangheta in Calabria and, to a lesser degree, Sacra Corona Unita in Puglia. That, in turn, has led to greater amounts of political corruption, cresting in 1992 with the murders of anti-mafia magistrates Giovanni Falcone and Paolo Borsellino. Despite the south’s central role in the election, there’s not much indication that any government would necessarily do much for the south, especially in an era of budget cuts. All four regions typically favor the center-right in Italian politics — former prime minister Silvio Berlusconi’s centrodestra (center-right) coalition won all four regions in 2008 and even in the 2006 elections, when center-left prime minister Romano Prodi returned to power, his coalition lost both Sicily and Puglia. Despite the strength of the autonomist Lega Nord (Northern League) in northern regions, such as Veneto and Lombardy, there’s not much of a counterpart in the mezzogiorno. To the extent there’s a separate ‘southernist’ autonomist movement in the southern regions, it’s split among a group of shifting regional parties that routinely aligned with the centrodestra, and that continues to be the case in this election — a patchwork of southern parties, Grande Sud (Great South), has joined Berlusconi’s coalition, making them, oddly enough, electoral allies of the Northern League. The winner in each region is important under Italy’s election rules — in each region, the party or coalition that wins the greatest number of votes is guaranteed 55% of the senatorial seats from that region. So in a highly fragmented election like the 2013 elections, Bersani’s centrosinistra coalition could win 30% of the vote and still take 55% of the seats in a given region. In the Italian parliament’s lower house, the winner of the national vote is guaranteed 54% of all seats, and polls show that Bersani is very likely to win the national vote. In contrast, however, the regional rules for the upper house mean that he’s far from guaranteed a majority in the Senato, and so may be forced to form a government with prime minister Mario Monti’s pro-reform centrist coalition. What kind of Italian prime minister would Angelino Alfano make? Due to electoral law considerations, Italy hasn’t seen any new election polls in 12 days, but when the polling blackout began, one thing seemed certain — former prime minister Silvio Berlusconi had cobbled together a strong centrodestra (center-right) coalition that had narrowed the once insurmountable lead of the centrosinistra (center-left) to within single digits. It still seems unlikely that Berlusconi could pull off a comeback that would return the centrodestra to power, but if he actually does, he has agreed not to return as prime minister in the next government. In a bid to bring the autonomist Lega Nord (Northern League) into his coalition, Berlusconi pledged to the Lega Nord‘s leaders in January to put forward former justice minister Angelino Alfano as a candidate for prime minister instead — that now looks like a wise move, given that the coalition has come within striking distance of the centrosinistra only because of the relative strength of the Lega Nord‘s supporters in northern Italy. In particular, the centrodestra remains essentially tied to win the Italian senatorial elections in the region of Lombardy, Italy’s wealthiest and most-populous, on the strength of the Lega Nord. Although Lombardy leans right in most years, Berlusconi’s unpopularity has put the region in play; in simultaneous regional elections, the Lega Nord‘s national leader Roberto Maroni is running a spirited campaign to become regional president. 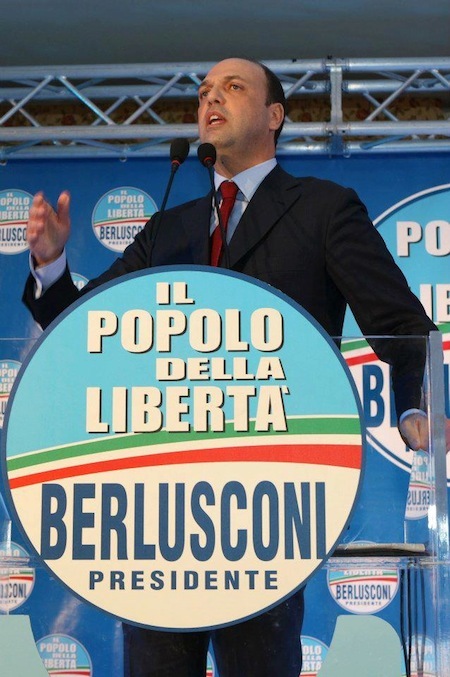 Notwithstanding his pledge, Berlusconi, as the leader of the Popolo della Libertà (PdL, People of Freedom), has led a characteristically spirited anti-austerity and populist campaign. 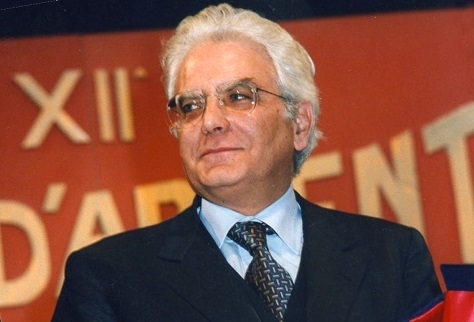 Unlike the PdL and the main center-left party, the Partito Democratico (PD, Democratic Party), the Lega Nord never backed the technocratic government of prime minister Mario Monti in November 2011. In a world where everyone has expected that Pier Luigi Bersani will lead the next Italian government, what would it mean if Alfano were suddenly in line to become Italy’s next prime minister? First and foremost, you should expect that even if Berlusconi isn’t technically heading Italy’s government, he won’t be too far away from the thick of things. He’s said that he would serve in government as Alfano’s finance minister (of all posts, you’d think Berlusconi wielding power over Italy’s finances would terrify investors and bondholders, to say nothing of German chancellor Angela Merkel). So there’s a chance that Alfano would serve as the Dmitri Medvedev to Berlusconi’s Putin — that’s something you might expect in Russia, but it’s not quite best practices for a thriving democracy or for Europe’s fourth-largest economy. Alfano currently serves as party secretary of the PdL and, when Berlusconi stepped down as prime minister in November 2011, he indicated he would leave frontline politics and quickly anointed Alfano — over older figures like former finance minister Giulio Tremonti or the more staunchly conservative Rome mayor Gianni Alemanno — as his preferred successor. Berlusconi being Berlusconi, of course, Italy was subject to an on-again, off-again Hamlet act from Il cavaliere, who gave contradictory indications about a return to politics before confirming in December 2012 that he would lead the PdL into the next general election. Counting hasn’t yet started in Sicily’s regional elections. But the one thing we know so far is that the electorate was far from enthusiastic for Sunday’s vote — just over 47% of eligible voters turned out for the Sicilian elections, a decline from the nearly 67% turnout at the last election in 2008. We’ll have some firm results on Monday. In the meanwhile, check out the background on Sicily’s elections here. It took ten years, but former prime minister Silvio Berlusconi was convicted today of tax fraud and sentenced to four year in prison (although reduced to just one year under a 2006 amnesty law). Italy’s appeals process is lengthy and complex, so there’s a very real possibility that Berlusconi’s conviction, already ten years in the making, will be overturned. Although today’s tax fraud conviction is more serious than Berlusconi’s prior convictions, he’s evaded final justice in Italy before. A perjury conviction in 1990 was set aside under a prior amnesty law and a conviction for illegal financing Berlusconi’s political party in 1997 was set aside after the statute of limitations expired before Berlusconi had exhausted his appeals. For today, it seems very likely that the conviction will prevent Berlusconi from reversing course on his announcement, made earlier this week, that he will not seek to lead Italy’s center-right into the next general election, expected in April 2013. It was thought that Berlusconi has enough money and control over Italy’s media to reverse his decision — and conceivably still could, although I think it’s now virtually impossible for Berlusconi to make anything like a successful comeback in time for 2013. In addition to the tax fraud trial, Berlusconi remains in the crosshairs of various Italian prosecutors, including for abuse of power charges, such as the use of state flights for personal use and for printing wiretapped conversations. Most sensationally, though, Berlusconi is being investigated for prostitution charges stemming from a sexual relationship with a Moroccan teenager, named ‘Ruby Rubacouri’ in the Italian media. Generally, Berlusconi has become a laughingstock for the allegations of ‘bunga, bunga‘ parties while in office lavished on Italian VIPs featuring orgies with young women. Ironically, notwithstanding the energy and time that Berlusconi’s various governments spent passing immunity laws designed to shield Berlusconi and his allies from prosecution in Italian courts, the 2006 amnesty law that would reduce Berlusconi’s sentence to just one year was passed by the center-right government of former prime minister Romano Prodi. In brief, Berlusconi has been convicted for inflating the costs of certain TV rights by his media company, Mediaset, in order to offset his tax bill. Essentially, at the time Berlusconi created his media empire in the late 1970s and 1980s, Italy featured only public television channels nation-wide. In building his media empire, Berlusconi bought local stations and broadcast simultaneous content, essentially cobbling together many local channels with synchronized programming, thereby establishing Italy’s first private television networks. As such, Berlusconi commanded an incredible amount of control over Italy’s media, from his first successful campaign in 1994, through today. There will be plenty of time to think about the next Italian general election if, as is likely, current prime minister Mario Monti is permitted to carry on with his technocratic government until April 2013, the last date upon which the next general election must be held. The Economist points us to reports in the Italian press that Silvio Berlusconi (pictured above, right), the éminence grise (well, surprisingly jet black) of Italian politics since about 1994, is likely to lead the center-right in the upcoming election and is taking an increasingly critical position against Monti’s government. Italy’s federal government, a technocratic government formed under Monti, an economist and former European Commissioner, with a mandate to reform Italy’s sclerotic economy and shrink its bloated public sector — with the support of Berlusconi’s own center-right Il Popolo della Libertà (PdL, the People of Liberty) and the main opposition center-left Partito Democratico (Democratic Party), has managed to keep a skittish bond market at bay, which has been spared, for now, the same fate as Spain in the bond market last week. Meanwhile, The New York Times last week showcased the fiscal problems of Sicily, which is tottering further on the edge of a debt crisis than Italy itself. 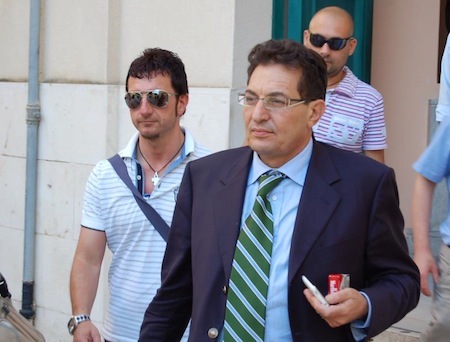 Monti’s government recently sent €400 million to Sicily to forestall a potential default by a region that has long been plagued by low growth, outsized government patronage and abuse of its considerably autonomous power — to say nothing of the Mafia corruption issue. 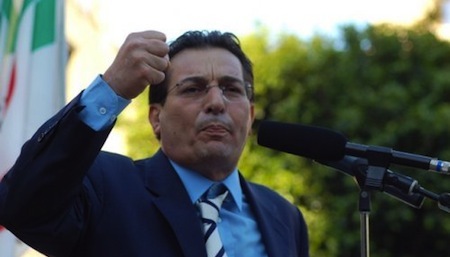 Today, in fact, Sicily’s regional president, Rafaelle Lombardo resigned following an indictment for corruption — elections follow for October 28 and 29 of this year. Since November 2011, when Berlusconi stepped down, more or less in disgrace, he has kept a fairly low profile. But everyone knows as long as he’s around, he would have been the chief behind-the-scenes power of Italy’s center-right. 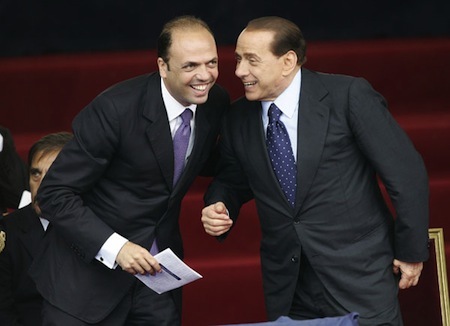 So when he seemed to designate a successor in November in former justice minister, Angelico Alfano (pictured above, left), now the secretary of Berlusconi’s PdL, it seemed difficult to believe that Il Cavaliere, as Berlusconi is known in the Italian press, was really stepping aside. Italian politics have long been fragmented, but like Greece earlier this year, Italian voters seem to be fragmenting even further under the weight of austerity measures introduced by Monti’s government. 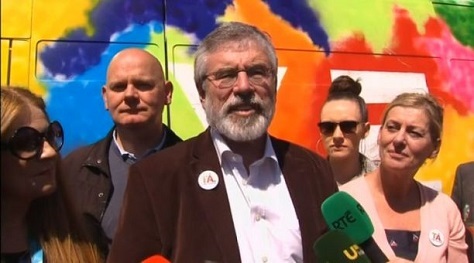 Monti himself has said he will not run for election in his own right under any banner. But above all, Berlusconi’s ace is that he still has more media power than anyone else in Italy. He also remains the most charismatic leader among a political class of bores — for instance, has anyone outside of Italy even heard of Pier Luigi Bersani, the main center-left opposition leader? 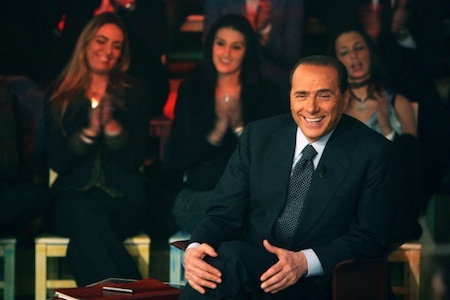 Berlusconi practically invented Italian television in the 1980s by buying TV stations across Italy and harmonizing their content at a time when RAI (Italy’s public television network) was supposed to hold a monopoly on national stations. He still holds an incalculable political advantage because of that power — it’s what helped him burst onto the political scene in 1994 and what helped him keep power in much of the 2000s, even through the last days of sordid accusations of his cavorting with underage girls and prostitutes at ‘bunga, bunga’ parties. It’s not clear that Italian voters are willing to turn back to those days (a strong majority of voters say they refuse to back Berlusconi ever again), but if anyone can pull it off, it’s Berlusconi. Also, for a premier who spent a significant amount of legislative time in the 2000s crafting immunity bills to protect himself from prosecution relating to all sorts of seamy dealings, Berlusconi is likely tempted by the shield from prosecution that yet another stint in office would bring — or at least tempted by the opportunity to parlay a political comeback into a term as Italy’s president in the future. But Alfano’s Sicilian heritage raised an eyebrow in November and it does so especially now, with Sicily’s finances in the headlines and yet another Sicilian president resigned under ties to the omni-present curse of Mafia infiltration. It’s worth remembering that “Italy” as a national concept really only emerged in the 1860s — and even today, just over 150 years after “unification,” it’s hard to think of Italy as a true country, even if you don’t believe that nationhood in Italy is really a myth-laden fluke. You have to go back to the mid-1950s to find a Sicilian who has served as Italy’s prime minister — Mario Scelba. 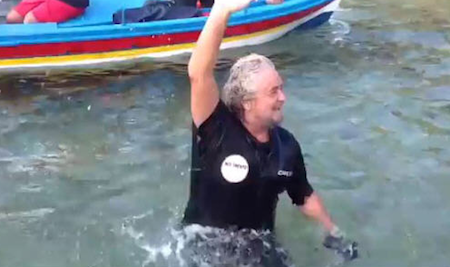 No Sicilians have served as president of Italy in the current republic. No Sicilians have served as president of Italy in the current republic. That may not be so surprising, given that Sicily is so far away, not just geographically, but culturally from Rome, to say nothing of Milan or Florence or Turin. Although Sicilian votes essentially enshrined Italy’s old Christian Democrats in power until the 1992 Tangentopoli (‘Bribesville’) scandal that, in effect, wiped clean Italy’s political slate, Sicilians have rarely held the highest office in Italian politics. So with Sicily’s finances and its corruption in global headlines, the “Sicily question” is yet another for Berlusconi to sideline Alfano as the 2013 elections approach — for the time being, at least.